Nyang Ral Nyima Özer (Tib. ཉང་རལ་ཉི་མ་འོད་ཟེར་, Wyl. nyang ral nyi ma 'od zer) (1124-1192) was a mind emanation of King Trisong Detsen and the first of the Five Sovereign Tertöns. His termas contain cycles associated with the guru, yidam and dakini, but mostly the latter two, especially the cycle of the Kagyé Deshek Düpa and the dakini cycle of Tröma Nakmo (Wyl. khros ma nag mo). 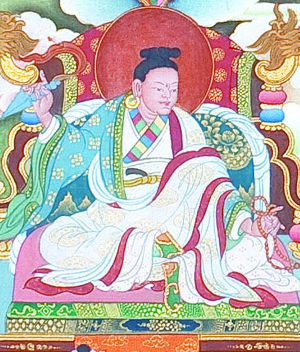 The guru cycle is called Lama Yongdzok (Tib. བླ་མ་ཡོངས་རྫོགས་, Wyl. bla ma yongs rdzogs). Dudjom Rinpoche, The Nyingma School of Tibetan Buddhism, Its Fundamentals and History, trans. and ed. Gyurme Dorje (Boston: Wisdom, 1991), page 755-759. Daniel Hirshberg, Remembering the Lotus-Born: Padmasambhava in the History of Tibet’s Golden Age (Somerville, MA: Wisdom Publications, 2016). This page was last edited on 15 February 2019, at 05:56.